Samsung has finally unleashed the 6th iteration of its flagship Galaxy S series, the Samsung Galaxy S6, along with the Samsung Galaxy S6 Edge. The Korean giant has responded to criticism over the plastic nature of it’s handsets and created a pair of powerful Android powerhouses that will have Apple more than mildly concerned. In fact it’s arguable that Samsung has finally hit upon the ultimate blend of in-house technical mastery and design. Previous versions from the S3 to the S5 were technically proficient, delivered innovation, but rarely troubled design award judges. The S6 and S6 edge could just change that. Technically speaking, the S6 and S6 Edge are identical, the Edge sporting a slightly larger battery, presumably to cope with the demands of powering ‘edge’ lit curved screens. Build quality is pretty exquisite, a 6.8mm aluminium unibody houses two sheets of glass, front and back. No removable battery, no microSD, just SIM, power and volume buttons to break the lines. It’s arguable that the S Edge is the design winner, that curved screen is stunning, but it’s likely to sell far fewer units than the good ol’ S6 we’re betting. The S6 spec is as high-end as you could wish. A chunky 3GB RAM, Super AMOLED QHD 5.1-inch screen cranking out 577ppi resolution, a crazy fast Octacore chipset and 32GB / 64GB / 128GB onboard storage iterations. Camera-wise, we’re talking a 16MP rear camera and a 5MP front camera, fronting low light sensitivity, Auto HDR mode and optical image stabilisation. Samsung has kept many of their innovative technical twists, such as the HR monitor built into the camera flash, support for multiple wireless charging (not Qi) standards and they’ve beefed up their fingerprint reader in the home button. This last seems much slicker in the S6 than S5, and Samsung have also launched Samsung Pay to capitalise on it. The company claims this will rollout to a wider retail base ‘than any other solution’, starting this summer in the US and South Korea. Given partners like Visa, Mastercard and American Express it might just work. Finally, the big question – the Samsung S6 battery life. Samsung have cut the battery size in the S6 over the older S5 significantly, down to 2550mAh. The company claims that their in-house octacore chip is 40% more efficient in some areas, and this claim is set to be tested very thoroughly indeed. 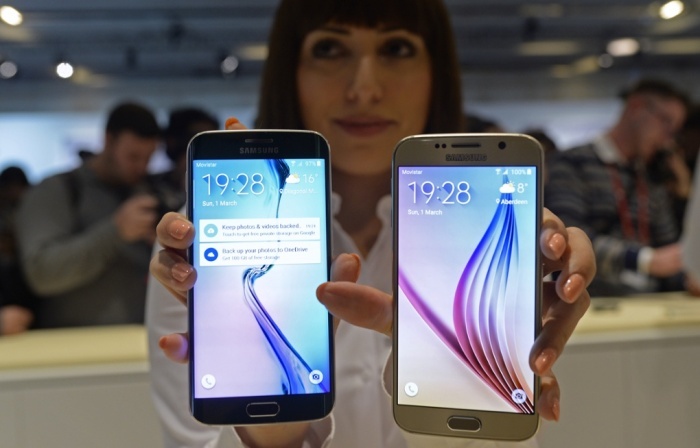 Overall then, the S6 and S6 Edge are among the best-looking and most proficiently specced phones on the market. They’ll be stocked everywhere from Harrods to Argos, and will sell in their millions. Apple should be very worried indeed. The Samsung Galaxy S6 UK onsale date is April 10. Three, Vodafone, O2 and EE have all confirmed they will stock the Samsung S6, but pricing is not yet confirmed. Editor-in-chief of all things tech, sports and fitness. Ultra and marathon runner. Utility-man footballer. Expat Devoner.